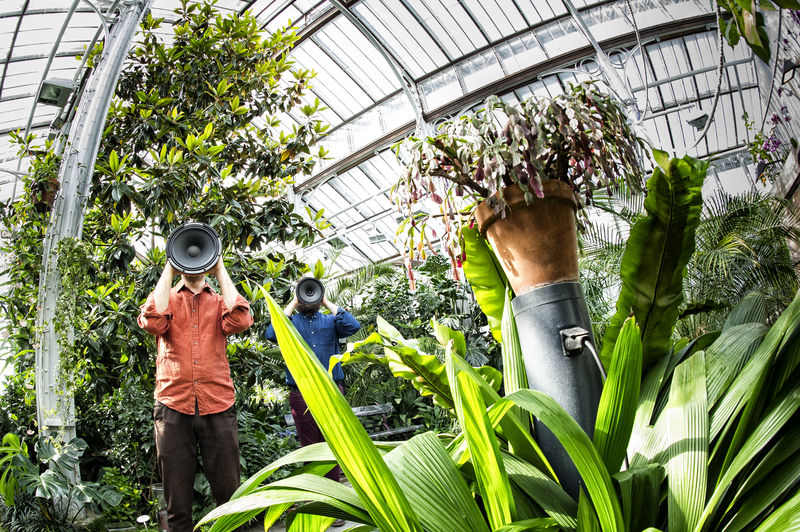 IN SITU is an interactive audio-architectural installation, which transforms the Winter Garden greenhouse (Talvipuutarha) into a gigantic musical instrument. For two weeks this Autumn, the entire glass structure of the Winter Garden will be turned into a multi-channel sonic space. Vibration speakers attached to the building’s glass walls turn the glass panels into speakers. The compositional work, the unique architecture and acoustics of the greenhouse, as well as the strong presence of plants all contribute to the creation of an extraordinary soundscape. IN SITU is a unique sound art piece by its original concept, its architectural nature and its dimensions. It constitutes the Finnish premiere for a whole building being transformed into a musical instrument. The work will bring together an original combination of sound and architecture with the larger issues related to the "greenhouse" concept, such as environmental issues and the poetics of connection/separation inherent to a glass structure. The work will also incorporate interactivity with natural elements both inside and outside the greenhouse: The soundscape is modified by an environmental data feed, both the long-term statistics of local climate change and data collected real time from the surrounding environment. The project fosters social awareness on one of the key contemporary issues of the anthropocene – the redefined relationship between the dominating human and the contained nature. Through the sonic medium, the piece will lead the public into a sensorial inquiry about the present-day dialectics/dialogue between man and nature. Welcome to the opening 22.9. at 12 - 15. Otso Lähdeoja is an Academy of Finland postdoctoral researcher presently conducting joint artistic and scientific research on structure-borne sound. Josué Moreno is a doctoral researcher at the Sibelius Academy conducting research on situated and architectural composition. The duo is backed up by producer Kati Åberg, and supported by the Sibelius Academy Music Technology Department, Kone Foundation and the Arts Promotion Centre of Finland. The project has been made possible with the kind collaboration of Helsinki City’s Winter Garden.